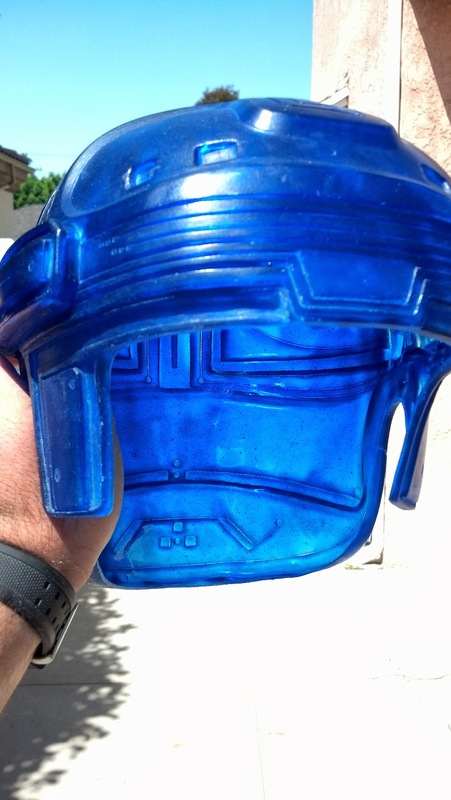 At the tail end of summer, I acquired a very cool cast of Flynn's helmet from the classic 80's movie, Tron from Colin Mayne on TheRPF. 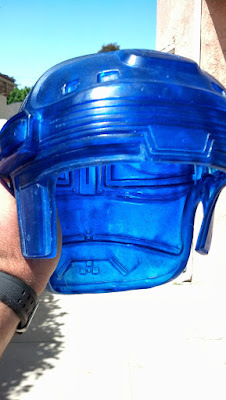 The helmet was cast in translucent blue allowing for it to lit from the inside. This posed a whole new set of problems for a prop replica newb like myself. The cleanup and prepping normally done to a cast were going to have to be done very differently. After some minor cleanup and sanding, I realized that I was not going to be able to primer this sucker... and white paint done by hand was going to be tedious. Having that realization, I set forth painting. And painting. And painting. The first coat went well but I knew this wasn't going to be a quick project. It took about an hour of painstaking brushing, all the while trying to not get excess paint in the detailed recesses. The second coat went a tiny bit faster now that I knew where the color was supposed to go but still the lighting hides a lot of the brush strokes. The third coat started coming along nicely, but by this time I was getting paint in some grooves. Ugh. By the fifth coat, the coverage was getting much better. At this point I used a tiny blade to lightly scrape away at the paint that bled into the grooves. It was surprisingly easy to remove, more than likely due to the fact that it was not primered. After some touchup and a final coat on the broad areas, I gave it two coats of clear coat. With the paint job done, I started thinking about how I was going to light this thing. The whole time I had an idea that I could use a mini LED strand and coil it inside the helmet to light it, so I proceeded to buy a 3 foot strand of mini LEDs and a 2 foot strand of EL wire (both in white). The first lighting test was cool but I wasn't getting the coverage I wanted and the strand placement was pretty apparent from the outside. The EL wire was nowhere near as bright as the LEDs so I quickly ordered a 6 foot length of mini LEDs. These strands were already wired to be powered by a 9volt battery and had a controller built in. They were purchased online from GlowHut. They were really fast, shipping the next day each time. I laid the 6 foot length in the helmet and then for kicks I added the 3 foot length as well. Here's a shot of the interior (the tape is holding the strands in place temporarily). The coverage is much better and makes for a pretty cool effect. I just need to figure out how to permanently attach the strands as well as possibly getting a beanie or cap to wear under the helmet. All in all, I'm pretty happy with the results. It's going to be a nice addition to the replica props I've been accumulating. 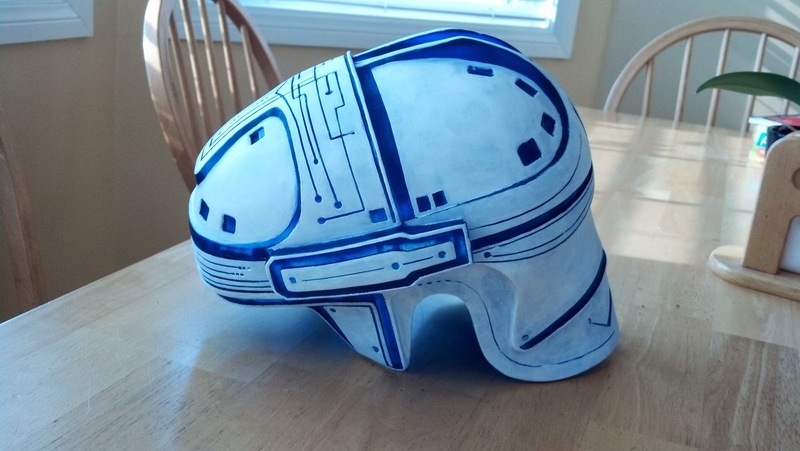 If you're interested in prop replicas, you definitely need to visit The Replica Prop Forum.